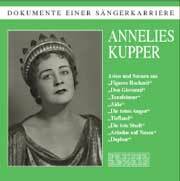 Annelies Kupper is part of German operatic history, and not just by virtue of performances in which she created a number of operatic roles for the first time in important premières. In her own special way, she was simply incomparable: she was one of the last lirico-spinto sopranos of the German-speaking world who had the ability to adapt her stage performance perfectly to her own personality. The beginning of Kupper’s great career came in 1946, when she was hired to sing at the Munich State Opera, where she remained a member of the ensemble for the next 20 years until her stage-farewell in 1966.